Artist Sean Hennessey is working through some new concepts for mixed media artwork. 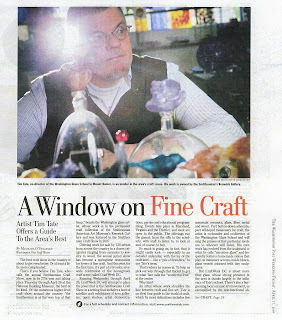 Sean has been a fast rising star of the DC art scene; his artwork is a unique blend of cast glass, concrete and pigments. Sean has been working with cast metal and steel, and has been welding steel components for his work. His newest series incorporates imagery based on transformation. Sean discusses his concept sketches and notebook of his designs with Professor Tim Tate. Click here to see his faux finishing site. Artomatic 2009 – the process starts! > Nicolas Timmers gives some scale to the area. The site selection for the 2009 Art-o-Matic arts festival took place at 55 M Street SE, Washington, DC – right atop the Navy Yard Metro Stop. Interesting to be able to look out over the former site of the school – now under the outfield of the Nationals Baseball park. 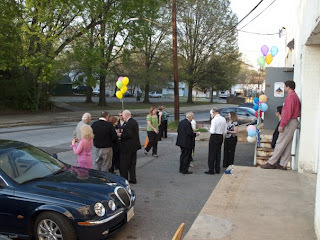 Artomatic opens May 29, 2009. View from the windows to the new National’s ballpark. Just beyond the red structure is where the Washington Glass School originally stood. 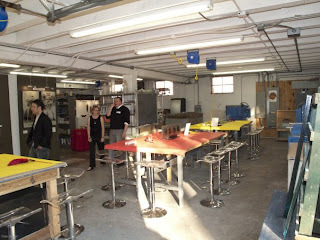 > Setup begins at the Washington Glass School for the James Renwick Alliance Gala. Photos by Anything Photographic. Michael Janis centerpiece. Erwin Timmers new works on display. Final walkthru before the event starts. Auction items on display. Cocktails at Red Dirt Studios. 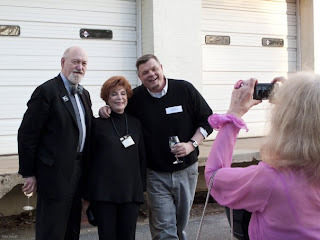 Tim Tate with JRA’s Shirley Jacobs & Chief Curator of Bellvue Arts Museum, Michael Monroe. 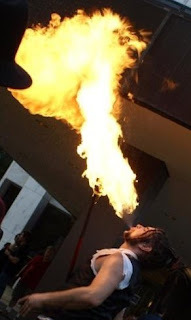 One of the events held as part of the CraftWeek DC was the Renwick Alliance Patron Gala – the ‘Venetian Carnivale’ – had a performance by the Dance Afire – part of the Contradiction Dance group were the stars! 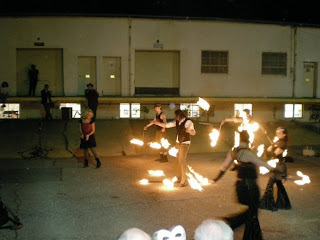 Lou Valentine led the performance that choreographed the performance/fire spinning for the evening. 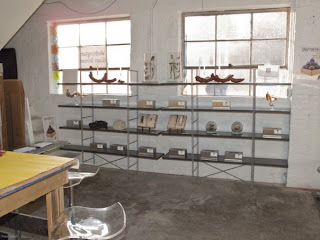 The ceramic artists were beside themselves in this high praise. > Erwin Timmers is excited about the changes. 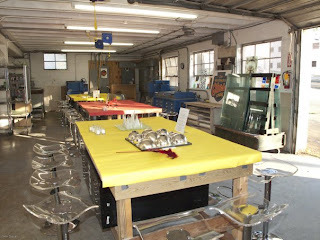 The Washington Glass School is one of the CraftWeek DC locations – earlier today there were artist demonstrations. For the evening, the space is being transformed into a glittering vernissage. Smithsonian Journeys host a destination tour of the Smithsonian Craft Show, the nation’s most prestigious juried exhibition of contemporary craft. As a tour highlight is a curator-led tour of the Smithsonian’s Renwick Gallery, a private tour of the Luce Foundation Center for American Art at the Smithsonian American Art Museum, and a tour of artists studio – which has been for the past two years the Washington Glass School. 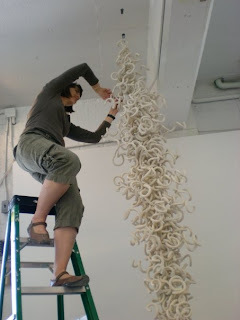 The host for the group is Charlene Johnson – an expert in contemporary American crafts. She received her Master’s degree in the history of decorative arts from Parsons School of Design, and now teaches a course on Ethnic and Folk Art Expression in Contemporary Art at the Corcoran School of Art. Charlene is at the Smithsonian American Art Museum, where she leads gallery talks on crafts at the Luce Foundation Center. The tour of the school included Allegra Marquart talking about her work, Tim Tate and Michael Janis talking about their techniques and work. Erwin Timmers new work (Knot)! 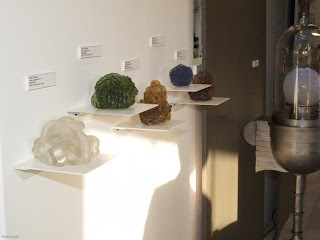 Erwin Timmers works on his new pieces – cast recycled glass knotts. Erwin fires the glass into plaster/silica molds and then chips away the plaster from the cooled glass. Hours of coldworking ensues after. Mr Timmers has engineered a ‘hands-free’ device to work the diamond lap wheel. 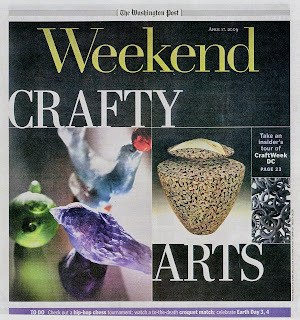 Erwin’s new pieces will be on display at the Craftweek DC demonstrations in the studio this week. 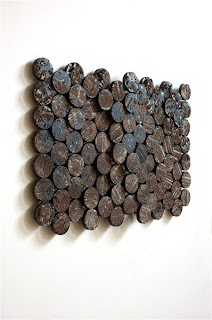 Kevin Mellema Reviews Target Gallery’s "Reclaimed"
> Kevin Mellema – (one of the few print media art critics left covering the DC area) writes his review of the Torpedo Factory’s Target Gallery exhibition of artwork made from recycled components – “Reclaimed”. 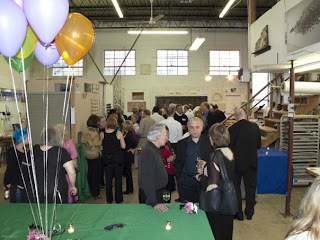 Curated by Light Street Gallery owners Linda & Steve Krensky, the show features an international group of eco-artists. 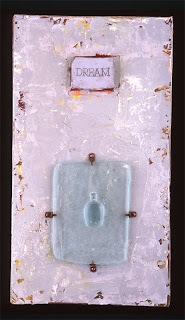 Erwin Timmers’ cast recylcled glass and steel artwork “What We Leave Behind” is shown here – photography by Anything Photographic. 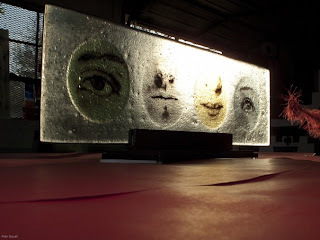 ‘Reclaimed,’ at the Target Gallery in the Torpedo Factory (105 N. Union St., Alexandria). This exhibit runs through April 26. For more details, call 703-838-4565 ext. 4 or visit torpedofactory.org/galleries/target.htm. Of all the galleries around town, the Target Gallery consistently does the best job of bringing in work from outside the Metro area. Target Gallery’s open call shows are truly open to all comers, where other galleries around town offer open call shows to Metro area or, at most, to Mid-Atlantic artists. The Target Gallery typically brings in work from across the nation, with a few international pieces as well. The D.C. area art scene operates in a bit of a bubble without any real connection to the outside world. We don’t even have a decent connection to Baltimore, and we’re practically joined at the hip. It seems to be a problem in general, but the Target Gallery is doing what it can to fight that insular structure. “Reclaimed” is a recycled materials show juried by Steven and Linda Krensky, Linda being the art dealer and Steve being the biggest art hound in town, seeming to magically appear at every art opening. The 33 works on view were culled from over 450 entries. Recycled shows can run the gamut from interesting to literally rubbish by a different name. Good recycled art runs off the act of raw creativity in its playful and innovative use of appropriated materials. In a sense, the work has the same underlying ethos of high-end design work. While high-end design operates in that rare environment where money is no object, recycled art hits at the other end of the spectrum, where money is not required. One could debate who’s got the creative upper hand here, but you’ve got to admire the folks making something from nothing. Of the 14 area artists in the mix, Erwin Timmers of the Washington Glass School gang shows his archaeologically-inspired take on 1980s era personal technology, titled “What We Leave Behind.” Adam Bradley assembled one of those ever-so-cool “Jet Pack” sculptures that takes us back to an innocent age of space travel and boyhood dreams. Honestly now, who doesn’t want to have a jet pack of their very own?